The unique Hampton Inn Boston-Natick hotel boasts 185 oversized guest rooms and 5 suites all with plenty of room for traveling families or the corporate road warrior making Natick one of the largest Hampton Inns in New England. *Complimentary Breakfast Buffet with hot and cold selections * Complimentary Wireless High-Speed Internet Access * Complimentary Parking * Only 17 miles west of Boston and all its attractions * Convenient to I-90 I-95 Rt 128 Rt 9 and I-495 * Local Logan Express Station /Scheduled Service to Logan Airport/ * Complimentary local shuttle service * Complimentary local and 800 phone calls * Complimentary credit card access phone calls * Complimentary USA Today Newspaper * Complimentary on-site Fitness Center * On-site Restaurant and Brew Pub with access from Lobby * On-site Thrifty Car Rental * Complimentary hot beverage service 24-hours a day * Guest Laundry * 7 500 square feet of meeting space in 10 dedicated meeting rooms * Don*t miss our complimentary baked cookies each night in the lobby. The Hampton Inn Boston-Natick stands out as the best value for leisure and corporate travelers tour groups and small to mid-sized meeting groups. 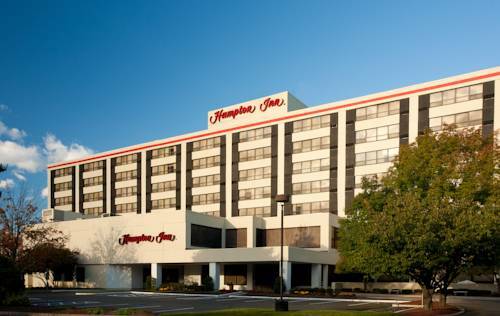 Hampton Inn Boston/Natick is conveniently located one mile from exit 13 off the Massachusetts Turnpike /I-90/. The hotel is surrounded by over 75 restaurants some of Massachusetts* largest shopping malls and many entertainment options. Whether traveling to Massachusetts on business or pleasure Hampton Inn guests enjoy our room amenities which now include features such as lapdesks massage shower heads and curved shower curtain rods for more elbow room. CNN ESPN premium movie channels pay-per-view movies and games are available. We love having you here at the Hampton Inn Boston-Natick hotel in Massachusetts.